And finally tonight: the world through his lens. Jeffrey Brown has a look at the extraordinary journey of photographer Gordon Parks. Two children with a doll, who are they, and what are their lives like? A young man walking away from us, where is he coming from and where is he going? Armed with his camera, Gordon Parks told stories of individuals and, through them, of the larger world. He had a fantastic ability to, you know, compose a series of elements within a picture to convey a sense of — of a story. 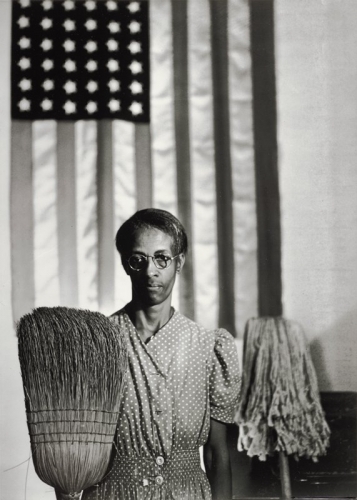 Philip Brookman is curator of Gordon Parks: The New Tide, an exhibition at the National Gallery of Art in Washington. Spanning the first 10 years of his career, from 1940 to 1950, it's a chance to see how a young man, self-taught and without a high school diploma, became one of the 20th century's master artists. Parks came to an understanding, I think, really before he ever picked up a camera, that it could be a tool for him to use to be able to express his own feelings about his life. Gordon Parks was born in Fort Scott, Kansas, in 1912, the youngest of 15 children. He credited his mother, Sarah, who died when he was 16, with giving him confidence and strength, even growing up amid poverty and prejudice. Parks spoke of his childhood in a 1997 "NewsHour" interview. That disadvantage sometimes pushes you, you know, if you use it right, because you want to rid yourself of those things that hurt you emotionally when you're coming up. Inspired by the work of Dorothea Lange, Walker Evans, and other Depression era photographers he saw in magazines, Parks first picked up a camera at the age of 25. In St. Paul and then Chicago, he took portraits, including Marva Trotter Louis, a performer, model and wife of boxer Joe Louis. He befriended and photographed leading African-American artists and scholars, including Langston Hughes, Charles White, Alain Locke. And he did his first journalism, covering Eleanor Roosevelt's visit to a South Side community center. Parks called the camera his choice of weapons. Gordon Parks always had a sense that media, that the camera and photography and writing and media, could be a very important tool in helping the world understand the image of African-American people. And it was through that understanding that you could make the world a better place. In 1942, Parks was awarded a prestigious fellowship, allowing him to work as a photographer for the Farm Security Administration. His first assignment? Documenting African-American life in Washington, D.C., then a deeply segregated city. Among his early works, this photo of a young boy who lost his leg in a streetcar accident. I was really struck by, you know, how intense the relationships are in the picture. Relationships between the photographer and the boy, but also the relationship between the boy and the two girls sitting across the street. These are things that Parks put them there for us to find. And he knew he was doing that. It was here Parks created one of his most famous photos, a portrait of Ella Watson, a cleaning lady in a government building. I first asked her about her life, what it was like. And it was so disastrous that I just felt that I must photograph this woman, and in a way that would make me feel, make the public feel about what Washington, D.C., was in 1942. The now iconic image, called "American Gothic" after the famed painting by Grant Wood, was part of a larger series on Watson, her family and community, an extended photo essay style that Parks would go on to use throughout his career. Parks, often, he would meet people, and he would talk to them. He would learn their stories. He would understand who they were, you know, long before he would ever bring along a camera. He was able to use his own experiences and his own struggles to understand and empathize with others. In 1944, Standard Oil hired Parks as a photographer. He would continue to hone his craft, and earn his first real paycheck, traveling around the country shooting scenes and portraits like this one of an oil worker at the Penola grease plant in Pittsburgh. What he's done is, he's created a portrait of a heroic African-American worker working for Standard Oil. This is an amazingly, you know, technical photograph to produce. And, you know, in a very short time, Parks has learned, you know, the skills, and mastered those skills. He photographed white fisherman and farmers, black pilots training for war, and he continued to break barriers. In 1949, he was hired as the first black staff photographer at "LIFE" magazine, where his photo essays included one on a Harlem gang member named Red Jackson. He also traveled internationally, shooting high fashion spreads in Paris, and celebrities like Ingrid Bergman in Italy. In 1950, he returned to his childhood home in Fort Scott to shoot a series for the magazine. And all of this was just the beginning. Parks would go on to write several memoirs and novels, to direct films, including "Shaft" and an adaptation of his book "The Learning Tree," and to compose music, while continuing to work as a photographer. He never understood that he wasn't supposed to do it. He just did it. Gordon Parks died in 2006 at the age of 93. The exhibition Gordon Parks: The New Tide is on through February 18. For the "PBS NewsHour," I'm Jeffrey Brown at the National Gallery of Art in Washington, D.C.